Ntinda has been on the rise since the 1980’s and is becoming increasingly upscale. Many prominent Ugandan politicians live in beautiful, expensive homes in Ntinda. If you choose to live or stay in here, you’ll be a bit of a hike form the city center, about a 15-minute drive without traffic (keep in mind that traffic-free roads are as likely as a blizzard). The hike to the city is worth it for many people because the residences are unapologetically peaceful and quiet, and Ntinda is a relatively self-contained bubble. If you don’t want to go to town specifically, you don’t need to. The Ntinda Road/Kira Road intersection is the hub of Ntinda. Here, you can find pharmacies, whole in the wall restaurants, pork and chicken joints, grocery stores, banks, and cool, cheap street vendors. 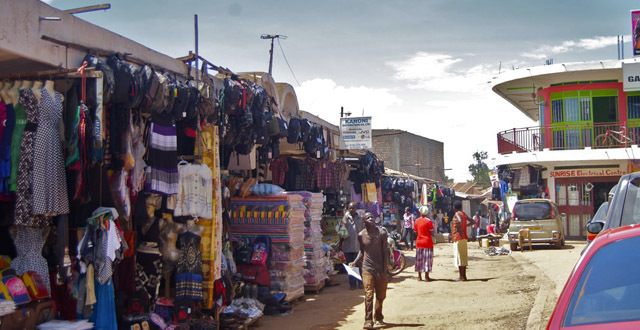 Although there are some huge Supermarkets in the area, Ntinda maintains an independent, less big-business feel than other similarly upscale areas. One of the main tourist attractions in Ntinda is the Ndere Dance Troupe at the Ndere Cultual Centre. Definitely don’t miss out on the show! Arch Apartments – Quiet apartments with large gardens. Rooms available for $40-$60 per night. And suites range from $100-$120 per night. Ntinda Apartments – Located on Plot 7, Commercial Road: Beautifully furnished apartments, all amenities, a pool, and gym. Very secure. $2,000 per month. Most of the hotels in Ntinda are good budget options, perhaps because they’re a bit far from the city center. But they offer unique expereinces, especially the Ndere Centre where you can opt to stay in a communal cottage. This is a quiet, safe place to stay. Close Motel – Cheap, quiet, budget hotel. Rooms ranging from $25-$45. Nob View Hotel – In Ntinda, very close to Bukoto, walking distance from Kabira Country Club. Simple, budget rooms. Clean spaces with hot water and balconies with a view over quiet, residential area. Good breakfast and a big pool. Good service, WiFi available in common area. Cheap laundry services. Rooms range form $50-$100 per night. Minister’s Village Hotel – Budget hotel, all of the rooms have balconies. Rooms range from $35- $65 per night and apartments cost $200 per night. Ndere Centre – A bit removed from town and even most of the action in Ntinda but located on beautiful, peaceful grounds with a nice restaurant. It’s a cool experience to stay here because of the small, personal feel, limited rooms and communal settings. Single cottages with kitchens for $30, double cottages are $20 per person and self contained rooms are $50. If you stay in a cottage alone you’ll share it with other guests, or you can rent the whole thing for your family or a group of friends. Near by Kabira Country Club – (Bukoto) A great place for families with lots of facilities including: gym, squash courts, swimming pools, tennis courts, basketball court, jacuzzis and saunas. Activities range from fitness classes (Yoga, Pilates, Body Pump and Spin) to massages, facials, exfoliation treatments. There is also a bar, restaurant, cafe and lounge areas where you can spend the day relaxing or comfortably working. Full membership costs 1,200$ per year. There are also short and long term accommodations available at Kabira. Cottages range from $120-250 per night and $1800-$3200 per month. There is lots of shopping in Ntinda including market style vendors around the Ntinda, Kira road intersection where you can find clothes and convenience items. Two big, efficient grocery stores. Costumes at Capital shoppers and used books at Ntinda Shopping Center are two destination items to be found in the area. Ntinda Shopping Center – A new, multi story shopping center that has everything. A huge Quality Supermarket, retail, pharmacies and computer shop, access to Barclays, and beauty parlors. A great used book store is on the 2nd floor. Super Supermarket – A standard, local supermarket that is usually well stocked with the basics. Tusky’s – Fully stocked grocery store, bakery and pharmacy. Prepared food available for takeaway. The second floor has clothes, furniture and electronics for sell. Capital Shoppers – Shopping center and supermarket, a sports bar with tons of TV’s to watch sports to your hearts content. Also a party supply store with lots of fun costumes and wigs! Quality Supermarket – Massive two story supermarket. Ntinda is a great place to hang out during the day and during early evenings. You can enjoy recreation and relaxation any afternoon at Kabira Country Club in near by Bukoto. It’s a great place to take a family with places to work, work-out, go to the spa or play. Ndere Centre’s cultural dance shows are a great Ugandan experience. Kampala isn’t full of touristy “Ugandan” experiences but Ndere celebrates the culture in a one of a kind way. You can learn about the different music and dance styles of regions throughout Uganda and be wowed when the girls dance with up to 8 pots stacked on top of their heads! Ndere Centre – A community centre that is committed to the promotion of Ugandan cultural pride and awareness. Ndere Dance troop performs cultural dances and musical stylings from all over Uganda. Enjoy the amazing and inexpensive show in an outdoor amphitheater, if you like dance and music I definitely recommend this show. You can reserve tables and have drinks and a Ugandan buffet dinner with the show if you like. You can check online for more events at the Centre throughout the week but the main dance performances are Wednesday and Friday 7:00-9:30 and Sundays from 6:00-9:30. They also coordinate 5-12 day safaris, have lodging and a restaurant. Ntinda specializes in quick places to grab take away and local pork joints. There are lots of fast food options and Ndere Center has a cool restaurant with upscale local dishes. Haven Cafe is my favorite oasis in Ntinda, quiet and cozy, it’s a great place to relax. Carnival – Lively African cultural dance show and music while you dine over all-you-can-eat meat platters! Great atmosphere, expensive, delicious food. Uganda’s version of Brasilian Carnival. Ntinda Takeaway – Decent fast-food, easy to grab on the run. Good Chicken and Chips. Spicy – Across from Ntinda shopping center, a small, simple dining area, two nice tables on the patio, fast foods/snacks $4. $10 dinners and chicken platters and good Indian dishes. Take away available. Zanzi – A local chain Pork Joint. Purportedly some of the best pork in Kampala. Taste Budz – Good, cheap fast food. Pizzas, burgers, ice cream etc. Mr Tasty – Fast food. Slogan: “Mr. Tasty, the taste that makes you go Hmmmmmm”. Enough said. Ndere Centre – Limited indoor seating and bar, outdoor seating surrounded by beautiful flowers. Buffet is $25, Chicken, duck, fish, goat, vegetarian entrees and curry dishes are $5-$12. A great breakfast spot for coffee, fresh juice, and omelets in a peaceful setting. Restaurant open from 6:00 am- 10:00 pm. Free wifi available to customers, dodgy coverage in the restaurant, and better connection in the adjacent community center. Haven Cafe – A small, fun cafe. Great ambiance (small place but there is also seating outside on the deck), delicious bakery, smoothies, ice cream, pizzas and full menu. A really peaceful oasis. They also deliver! Tessas Ice Cream – Small cute place in the heart of Ntinda, sweets and ice cream. Cafe Chocolat – A small, new cafe. Taj: Really good Indian food and some Chinese dishes, served in comfortable gardens and verandas. Generous portions at good prices. Not a lot of night life in Ntinda, Rhino Pub is probably the most popular bar amongst local night-owls. It’s a very local nightlife scene, small pubs like Buddys don’t offer much other than cheap beer and friendly crowds. Rhino Pub – Simple bar, cool place to grab a beer with friends, a little dark and dingy. Ugandan media personalities are often spotted here. Club Pa Lui – Night Club in Ntinda Shopping Centre, open from wednesday-saturday. Was known to be a fun dance spot, and Ntinda’s main source of nightlife, sadly it was shut down because of building codes. The new location is said to be opening in 2012. If you want to dance and mingle with students and hipsters in Ntinda, watch for that. Blue Mango – A cool, low-key sports bar at Kabira Country Club. Club Katalina – A mellow night life spot with local food. Buddy’s: Local pub with a bar and dance floor inside and patio seating outside. Cheap beer. Typical local DJs, reggae, 80’s pop, etc. There’s not much by way of healthcare in Ntinda. As always, we would probably recommend that you head to The Surgery Hospital in Kololo. Good job on the precise description of Ntinda. I had to make sure the information was up to par considering that is where i live :-). You have clearly done your home work. I believe this site will be of great help to individuals and families moving to Kampala. Thanks for this review! I haven’t spent much time in Ntinda in the past, so it’s incredibly helpful to have some ideas about what to check out now that I live here. I’m looking forward to trying Haven, especially! I did go to Spicy restaurant on one of my first days in this neighborhood, and wanted to note that though the dish I ordered was listed at 9,000 UGX, I was charged 16,000. They claimed that the menu had changed and they just hadn’t printed it yet, that there was nothing they could do about the price, and refused to give me change. Might want to watch out for that! What I ate was definitely not worth 16,000. Blue Mango also closed years ago I thought? Hello there, my sister is looking for a house mate the house is in kiwatule after ntinda,its fully furnished ,yiu will share a toilet and the bathroom. It has an instant heater and you will share rent and ulitilities.you can call her on 0784497849 and she will take u to see the room. I am coming to Uganda (from London) at the end of March. And I am looking for fun interesting people to hang out with. Hi, I’m new to Uganda, I’ve been here only a week, I’m looking for an apartment to rent on an good safe area not too far from industrial area or oasis mall, please advice or if you know any agents, please assist me with their details, I’m looking for a two or three bedroom hse.